The Owen Sound Bowling Alley has worked with Gem Webb Internet Marketing & Web Design Inc. From the beginning of September 2016. We have noticed a tremendous increase in sales, customer feedback, social media presence since using their services. With monthly in-person meetings, and over the phone conversations we have been able to communicate our brand effectively with gem web services. I strongly recommend any company to use their services if they are struggling with an online presence both for a website and social media. You will be noticed when you use Gem Webb and his content marketing team. 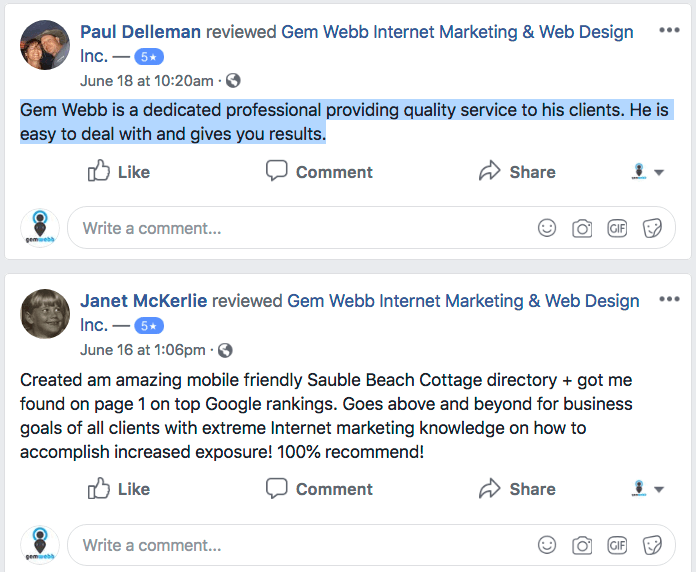 Chris Bearfoot | Bear Foot Park "Sauble Beach Cottages"
We have been working with Gem Webb Internet Marketing and Web Design since June 2016 for the first time. From our very first meeting Mr. Webb understood our needs to help further market our brand. He is the ultimate professional in his field, readily available by either phone or email. His great ideas have launched us significantly in the GOOGLE RANKINGS. We can't believe the business we have obtained so far this fall and our season usually doesn't even begin until the after the New Year. We are definitely looking forward to working with Gem Webb again to further market our niche in the cottage rental world. We give Gem Webb Internet Marketing and Web Design a 10+. Chris, your testimonial touched my heart a long with my teams. We place a huge importance on making sure our work has a return on investment for all our clients. The proof is in the statistics, Google rankings, phone calls, emails and more. We're glad you understood the value of our custom package and that you moved ahead at the right time so Google could rank you higher for the tourism's shoulder season. We understand the local GreyBruce area very well and will continue to assist your cottage rental company and all others that are looking for increased business customer exposure! Kyle Davis | Renewed Computers "Owen Sound Computer Store"
Our business, ReNEWED Computers, hired Gem to design our web page and to assist with marketing among a long list of other things. Gem is very personable, professional and aggressive in boosting profits for the Company's who hire him. We are very happy with his services, Gem is an A++ Internet Marketer and Web Designer! We HIGHLY recommend giving him a call. Kyle, Thanks for your compliments sharing how my team communicates professionally with our clients + how we're always business goal focused. Technology can be intimidating, that's a fact. That's why my company has a value add proposition offering education to all clients. We also make sure there is a reason for everything we do for each client. This is why we have different solutions for each client - it's not always a website that you may need. By digging into how each of our client see's their industry and customer issues, we can then tailor a custom Internet marketing solution for their company. Thanks for entrusting your Owen Sound computer store's brand and customer reach to us. Your Google rankings of page 1, spot 1 for your top 10 keywords make us feel like that we've accomplished our job! I can not say enough praise for Gem ,our ranks in the various web search are in the top 1-3 at all times. Gem designed a very professional web page which brought us out of the dark ages. Would highly recommend them. Ron, Thanks so much. You're a super skilled mason that keeps the old ways of building to stand the test of time for all your local projects. I look forward to reading more about your jobs with photos as you update your website regularly. It's so inspiring to my company when clients are passionate and understand the vale of content creating VS static stagnant websites. Google likes building quality search links offering relevant content #1 this can greatly improve search rankings! Recently I had the pleasure of collaborating with Gem and I must admit I was blown away by his knowledge and experience. Gem's intelligence and integrity combined with his Mad Skills wrapped up in an affable personality is the reasons why I respect and recommend him to anyone serious about their business. Gary, you made me blush with this one! Thanks so much. You're Adsense skills are the best I've ever seen with a offer PPC package that'll increase any businesses exposure locally or globally! It's a pleasure to know you and I look forward to doing business one day! I hired Gem Webb Internet Marketing and Web Design to do a fast speedy website with a short deadline. He and his team of professionals, were able to build the site in the a lotted time without complaints. I highly recommend using Gem and his team for ensuring you have a solid Internet Presence. Thanks so much John for this outstanding review on our website job with a short timeline. We have a standard of excellence with all projects big and small. My team is looking forward to seeing your Google rankings dominate your Ontario competitors! Be well and thanks again for your business. 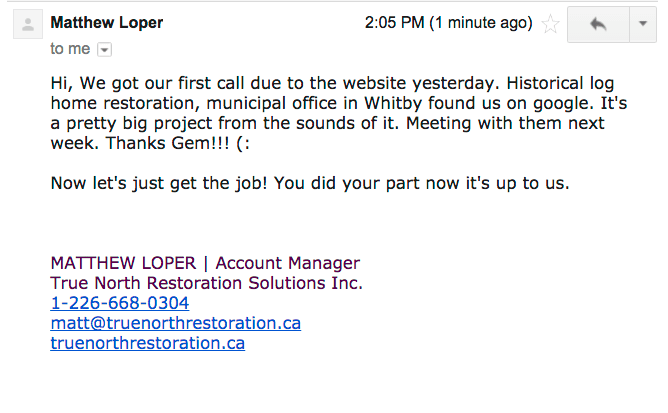 Thanks Lori, I really enjoy helping local Grey Bruce businesses to expand their reach to their customers online. Thanks so much for professional testimonial sharing my adept abilities with web development. Nancy CatoGem Webb Internet Marketing has been the best decision I ever made since I started my Online Directory Business, he is always friendly and helpful anytime of the day with any web design and Internet marketing. When my customers need service, I get immediate technical support I need to make my customers come back again and again! He has created a mobile friendly website that makes it easy for my customers consumers to contact their businesses on the site and on Google. Gem Webb offers me expert outcomes with Search Engine Optimization SEO as he PROVES HIS WORTH WITH GOOGLE RANKINGS! On top of all that, I don't have to wait days and days or even weeks for website updates and I get the hands on tech support I need to grow my business! Thanks so much Nancy. It's a pleasure to assist another Ontario directory as my experience with Bruce County Tourism's ExploretheBruce website and many social media networks was such a fun experience. I now look at all directory websites through a lens of what works and what didn't from 2009 to present. 2009 btw was the beginning of the importance of social media. Since we went live with a handful of changes we've seen 200 to 40% increases in your websites traffic. I know that if you stay the course and continue to use the Internet marketing tactics I've given you, that your website will be highly visible to your targets markets in 2016. Buckle up Nancy, it's business success time! Informed, and willing to take the extra steps to ensure the customer gets the desired outcome. Thanks Gem! We enjoy working with you! Thanks so much Julie. It was a pleasure to help reduce your cost savings by migrating from Yellow Pages to our website package and hosting package. You now have a full mobile friendly website that is keyword Search Engine Optimized towards your local target market both by service type and by area of interest. I look forward to helping you with your Internet marketing campaigns in 2016. I have been working with Gem for about two months and have had nothing but top notch service. Regardless the deadline, reasonable or code red, Gem is always there to help you through any situation. Thanks so much for the kind words of my teams efforts. We have a motto of under promise and over deliver with all aspects of our client projects / services. Your Sauble Beach restaurant website is a wonderful addition to our portfolio. We look forward to sharing success measurements with analytic reports over the next two years that will reveal increased business exposure. Gem made videos for two of our clients' products and I couldn't be happier. They were visually very well done with great lighting and creative use of camera angles to really show off the project! Thanks so much Corey for your kind words around the quality of my Youtube video creation. I feel honoured that your Toronto PR marketing agency choose me to create video reviews for your clients mobile device peripherals and technology. I have to say that I really love testing products live and am really looking forward to new gadgets in 2015. Video reviews are such fun as people should be able to see what a product is like prior to buying.